Virginia Heffker McKevitt was born in Long Beach, California but grew up in New Orleans, Louisiana. She married the boy next door and then moved to the Mississippi Gulf Coast. Hurricane Katrina changed her life. Family scattered and her world a mess, she and her husband moved to the mountains of Georgia. Her life took a change when she picked up a manuscript she had started while still in New Orleans. It urged her on. "Finish me," it cried. FRACTURE The Secret Enemy Saga has finally been released. 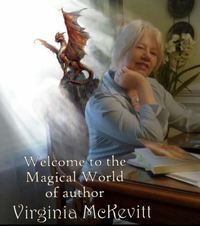 Now on a journey fueled by her love of fantasy, there is no turning back. Be entertained by this 5 star saga as it unfolds. You can find Fracture The Secret Enemy Saga at Amazon.com and Barnes and Noble, or on the Kindle, Nook, and other e-book readers. Book two, The Hunted, released in December at Smashwords, and soon in paperback, is already receiving high praises. I was surprised at how much I liked this book. The cover interested me but the story drew me in. The characters were well fleshed out and as McKevitt introduces each one you become to know them individually. The inner conflict of each character brings them to life and you find yourself wanting to know more. To ask Virginia McKevitt questions, please sign up. Virginia McKevitt I have a high maintenance brain and when it gets bored it makes up things, lol, so an idea formed. The story is fantasy so it's not based on normal…moreI have a high maintenance brain and when it gets bored it makes up things, lol, so an idea formed. The story is fantasy so it's not based on normal circumstances or events. It is purely a conceived idea that wandered around inside my head until I put it to paper. We’d love your help. Let us know what’s wrong with this preview of The Ghost Orchids by Virginia McKevitt. Just bought the second one. So excited to read it! Sophia wrote: "Thanks for the friend request, Virginia." Jill wrote: "Thanks for your friendship here on Goodreads, Virginia." Thanks for the friend request, Virginia. Thanks for your friendship here on Goodreads, Virginia. Rae wrote: "Thanks so much for the kind words, Virginia! And thanks for the GR friendship as well. :-D Hope you are having a great weekend so far!" Thanks so much for the kind words, Virginia! And thanks for the GR friendship as well. :-D Hope you are having a great weekend so far! Book two is in the works. New Orleans and Mardi Gras mixed with assassins and magic! This will be interesting brain work. Wish me luck. Thank you for the add, Virginia. Thanks. This is a busy place I see. Hi Virginia, thanks so much. Nice to meet you.